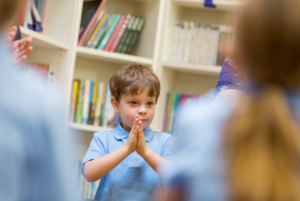 How many times should I have to decide I don’t want my child to attend worship? The legal requirement placed on all state-funded schools in the UK to enforce a daily act of collective religious worship is a bizarre feature of our education system, and one that is rightly regarded as an illiberal and indefensible affront to freedom of religion and belief. Well, almost indefensible. A defence of it does exist. It’s not a good defence, but it is nonetheless one that’s often parroted by exponents of this discriminatory practice. It’s called the ‘right of withdrawal’ – the option, in other words, to opt children out of the worship requirement. There are many reasons why this ‘right’ is inadequate, but chief among them is that despite the fact that parents shouldn’t have to opt their children out of compulsory religious worship in the first place, they often end up having to do so many more times than just the once. So, before we pick up our case study, bear in mind that even before this parent got in touch with us to ask for advice, she’d effectively decided twice before that she didn’t want her child to be involved in any worship, much less forced worship. The first time was simply when she decided that she was not religious, and, as is her right, took the decision to bring up her children in line with that conviction. That should really have been the end of it. Unfortunately, in the UK, the need for a fresh decision on this score follows shortly after when the mother, whose child has reached school age, is forced to discount a number of the state schools in her area on the grounds that those schools have a religious character that she does not share. Instead, she decides she’d like to send her child to an open and inclusive community school with no religious character or ethos, and which welcomes those of all faiths and none. Of course, given that in many parts of the country, for reasons of geography or otherwise, church schools are the only viable option for non-religious parents, this is a choice that’s not available to many, but we’ll forget that for now. The decision not to apply to a ‘faith’ school is, in effect, the second time she has decided that she doesn’t want her child to engage in worship. Setting aside the fact that the school is actually legally required to supervise the child, the mother decided that for all the risk of her son feeling excluded or being singled out by his peers – one of the many important problems with the right of withdrawal – he deserved the right to be free from undue influence and religious proselytising while he was young. That, as far as the law goes, should now definitely be the end of it. Decision number four, it seems, carried just about as much weight as the three that went before it. That’s now four separate occasions on which this parent, in our liberal, democratic, and broadly secular state, has chosen to excuse her child from having to worship a god she doesn’t believe in, at a school with no registered religious character, and on all four occasions she’s been unsuccessful. This happens all the time. Let it not be said, though, that in life there are no happy endings. Just when she thought all hope was lost, she managed to arrange a meeting with the head teacher and after an exchange of words, the school finally acquiesced. The child would be withdrawn. The fifth decision, in a meeting with a head teacher that should never have had to take place, was finally successful. Or was it? There’s every chance she’ll have to go through all of this again at secondary school.